Insanely popular across the Maghreb, name-checked in international spy novels and beloved of music adventurers like David Byrne, Libyan superstar Ahmed Fakroun is the most astounding raï-disco-funk pioneer you never heard of. His 1983 album, "Mots D'Amour", recently reissued by PMG, is regarded as a global fusion classic, and has had the whole Piccadilly staff (along with Natasha Bat For Lashes and Duncan Dutch Uncles) doing some sort of weird shop conga for weeks now. Well, the joy doesn't end there, and PMG have persuaded the Libyan legend to put together this self-titled anthology of songs recorded across Europe in the late 70’s. The grooves are slower, sweeter and lower slung with Fakroun’s multi-instrumentalist chops on the saz, mandol and darbouka drum truly coming to the fore. In amongst the exotic and esoteric grooves within, we have a welcome return to vinyl for two of Ahmed’s rarest and most sought-after 7”s. The Ned Doheny-via-Benghazi, West Coast grooving of "Nisyan" rubs shoulders with the Tommy Vance produced Balearic classic "Awedny" - alive with haunting flutes and relaxed funk. Elsewhere reggae-tinged lilters of "Falah" and "Yu Hussad" beam sunshine straight from your speakers and "Njoom Al Leyel" boasts a stoned funk one only finds in pre-Italo Italy. 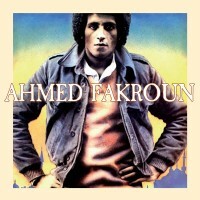 "Ahmed Fakroun" is the perfect late night, come-down album. Especially after a hot and sweaty evening in a raï club, somewhere in North Africa. Patrick says: After supplying a party power-up with a much needed reissue of "Mots D'Amour", PMG team up with Ahmed Fakroun for an anthology of the Libyan legend's late 70s output. Alongside rare as hens teeth Balearic belters "Awedny", "Nisyan" and "Sinini" we're treated to a whole set of low slung, lightly spiced North African grooves. William OnyeaborWorld Psychedelic Classics 5: Who Is William Onyeabor?